Father of Hadar Goldin, whose body is being held by Hamas, says Netanyahu bears the responsibility of returning Israel's MIAs. 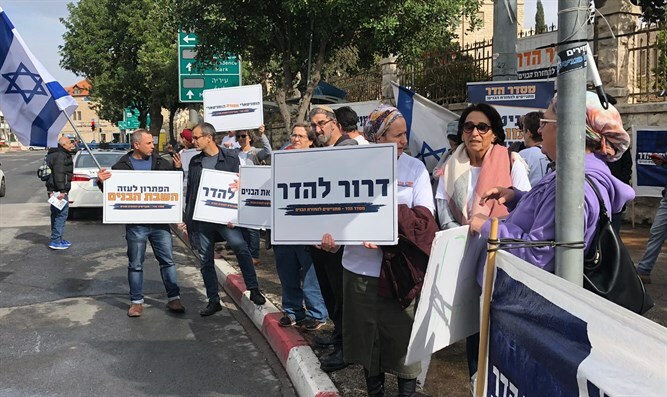 About 50 Israelis, together with the family of IDF soldier Hadar Goldin whose body is being held by Hamas in Gaza, on Friday held the weekly "Misdar Hadar" event outside the Prime Minister's Residence in Jerusalem. This is the 30th consecutive week in which the event is being held. After Prime Minister Binyamin Netanyahu was appointed defense minister following the resignation of Avigdor Liberman, the Goldin family decided to move the event from the Gaza envelope, where it was held until this week, to outside the Prime Minister's Residence. In addition to Hadar Goldin, Hamas is also holding the body of IDF soldier Oron Shaul. Two missing Israeli civilians, Hisham al-Sayed and Avera Mengistu, are believed to be held by Hamas as well. “Allowing aid to Gaza that does not save lives harms the efforts to bring Hadar, Oron, Avera and Hisham back to Israel," continued Goldin.